Bii is back in Malaysia for a autograph session on 26th November 2016 and fan meeting on 27th November 2016! Kuala Lumpur, November 2016 - Since the announcement of Bii’s Fan Meeting in Malaysia, the fans have responded positively by expressing their excitement on social media. 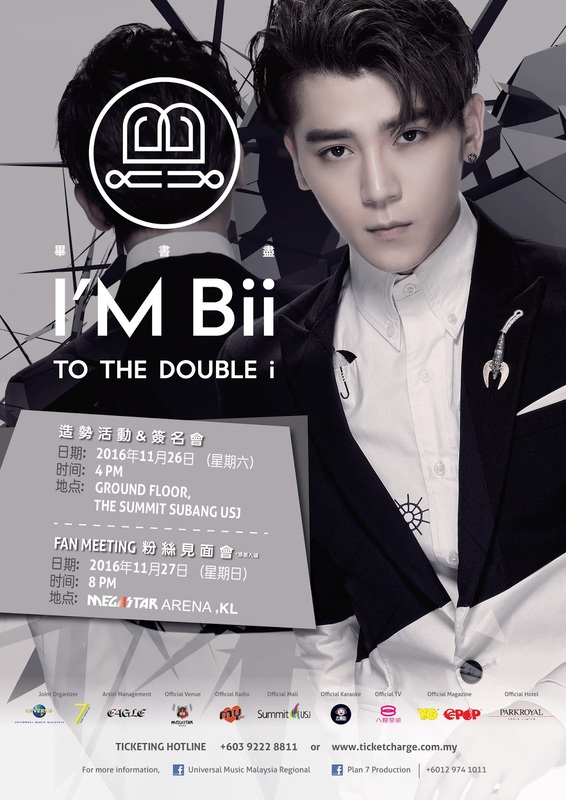 He will be in Malaysia to promote his 4th album titled “I AM Bii TO THE DOUBLE i”. After his last concert in 2015, he has attracted a great amount of fans from the Chinese community and surprisingly, the Malay as well. This year itself, he had successfully played a sold out show of 4000 pax in Taiwan. Bii expressed that he can’t wait to show his fans the hard work he put into writing and composing the songs of different genres that ultimately led to the success of this album. Fans can also witness a more mature side of him. According to Bii, both the letters “i” in his name represent different sides of him. However, with the double “i”, he will be able to give double the love to his family and fans. 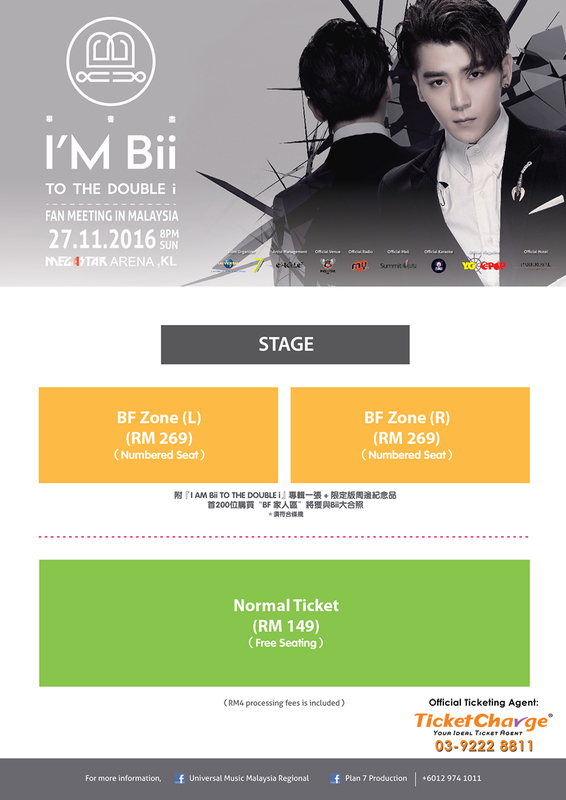 “I AM Bii TO THE DOUBLE i” Fan Meeting will be held on 27th November 2016 in Mega Star Arena at 8PM. The ticket will be divided to two categories, which are “BF Zone” priced at RM269 (numbered seat) and “Normal Ticket” priced at RM149 (free seating). The “BF Zone” category comes with “I AM Bii TO THE DOUBLE i” album and a limited edition souvenir. The first 200 “BF Zone” ticket holders will be able to get a group photo with Bii. All tickets include RM4 processing fee. Ticket launch begins on 14th October 2016, at 10am. Tickets are available at www.ticketcharge.com.my or contact 03 – 9222 8811. Bii 畢書盡 will also be having an Autograph Session Promo Tour which is going to be held on 26th November 2016, 4pm at The Subang Summit USJ. During the event, the fans can have the chance to get the autograph from Bii. 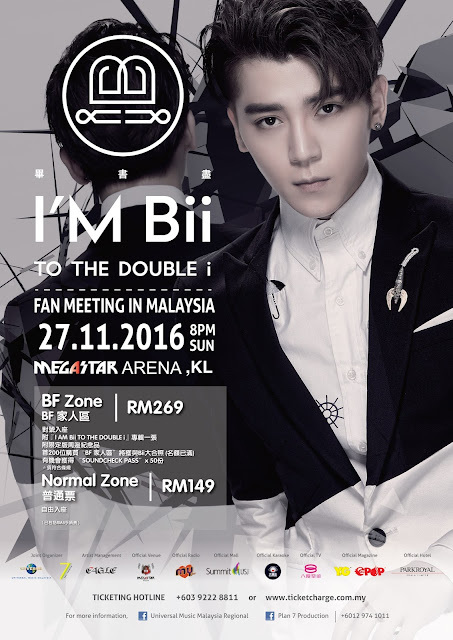 Those who are purchasing the tickets to “I AM Bii TO THE DOUBLE I Fan Meeting In Malaysia” during the Autograph Session Event will also have a chance to interact and play games with Bii.